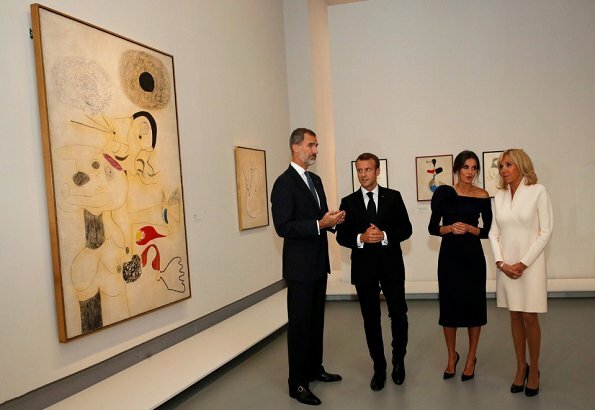 On October 5, 2018, King Felipe and Queen Letizia of Spain, French President Emmanuel Macron and First Lady Brigitte Macron visited "Miró, la couleur de mes rêves" exhibition including the works of Spanish painter and sculptor Joan Miró at the Grand Palais in Paris. From Oct 3, 2018 until Feb 2019, the Grand Palais will host an exceptional retrospective of Joan Miró and retrace the evolution of a painter at the forefront of the 20th century surrealist movement. Letizia looks very glamorous - Love the dress, her hair and the overall styling. Normally, I'm not a fan of Mme Macron's style - I always find her dresses a bit "boxy" her hair a bit "wiggy" but I quite like this look. Her dress is more balanced top and bottom and her hair isn't all brushed forward around her face in the usual way. No like Meghan, "messy" buns are the typical Spanish hairstyle. Meghan is from California, Spanish heritage..
Do you prefer the strict bun of Princess Victoria? The length is this dress of Brigitte M is quite good. I am really impressed by the elegance of both ladies, with still a little preference for Letizia. Don't be afraid she does not need to copy anyone. I thought the same as in the first picture she very much reminds of Meghan. There is follow up dinner, therefore the queen is dressed for both occasions. This dress is exquisite and the jewelry and accessories are elegant and regal. Love Letizia's hair, and no, she is not imitating Meghan (which won't be all that bad) only because she has been wearing these messy bun for several years, like many other women that are still young and enjoy a little bit of adventure in their formal updos. Welcome to the 21st century. 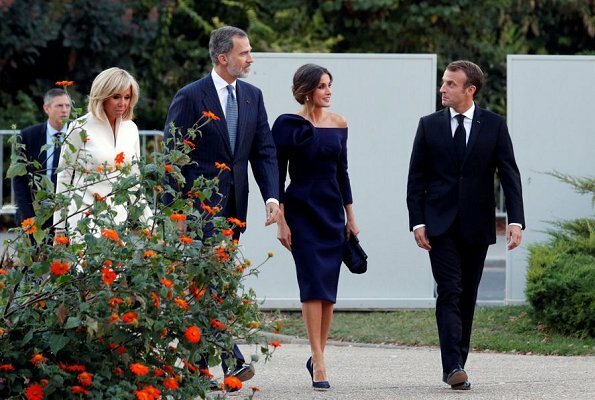 I also like Mrs. Macron's dress, as usual I think she would look so much better with a couple of extra centimeters, but nevertheless she looks fine. vind ik ook, het kleed van Laetizia is heel mooi maar niet voor dit bezoek. en wat is er mis met het kleed van mme Macron, klassiek kleedje, goed voor haar leetijd. Both dresses are elegant and fitting well.Letizia has a messy bun like Megan Markle . Q Letizia, Pss Madeleine, Q Maxima, etc have worn messy buns long before Megan entered royal scene. Okay, I'll rest my case, but to be brutally honest, I very much miss Letizia's shoulder length hair, and when she also had it curled. This is almost 4-5 years ago, think. Very interesting, sophisticated and warmhearted women, with different fashion style, which is very becoming. 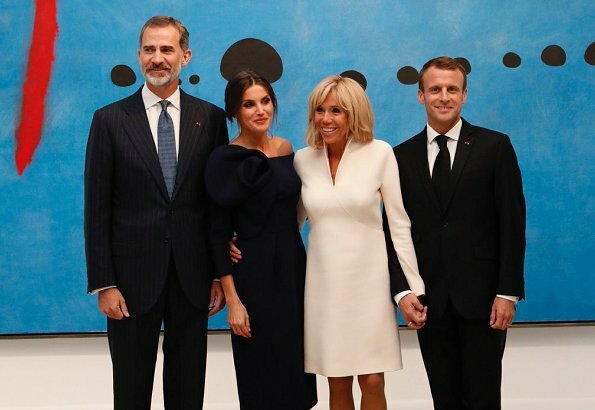 I like Letizia's dress and it looks lovely on her but I think it is a bit over the top for a visit to an art exhibition at the Grand Palais. Brigitte Macron is more appropriately dress on this occasion. I love her dress and the Megan messsy bun too ! janelarn, I suggest you read all the comments again. I think Letizia looks overdressed. They went to the exhibition and then, to have dinner at the restaurant. There were no cocktail. Letizia had already this type of bun recently. It's not a 'Meghan' messy bun as there are no long straggles around Letizia's face constantly requiring to be fidgeted with. Letizia looks fantastic, lovely dress, an excellent length for her, and gorgeous shoes. Mme Macron is also very smart but I agree that the dress would be more elegant if just a little bit longer. Letizia absolutely does have have tendrils of hair hanging down. If there had been any breeze, I am quite sure you would have seen her touching them. Mme Macron does seem to love her white clothing. This beautiful creation deserved a second outing for a formal visit. Perfect fit. The visit was said to be the opening of the art exhibition and a formal dinner after. The dress strikes a good balance since some pomp and ceremony are involved...The first time this dress was worn, in 2017 it was with an unstructured bun, the visit of the Israeli president to Spain 2017, unstructured bun...Arco earlier in 2018 unstructured bun...all well Before the arrival of Meghan into the royal orbit. ...some will repeat anything no matter how silly it sounds. Mrs Macron's day into evening look is crisp and appropriate. Lovely warm gestures towards the queen. What a WOW outlook from Letizia, best for long time. WOW... Love Letizia's dress. It's stunning. I just looked at Delpozo website, fantastic designer for women who "dare" and nice basics as well. Letizia's dress is a rare miss for me. The shoulder detail looks clumpy, awkward and a bit childish, like a middle school party dress. The more casual messy bun does not suit Letizia, especially combined with this fussy dress. Madame Macron looks best here--good skirt length. I completely agree. Not a fan of this dress. It even looks a bit frumpy on her (to me). She could have done much better from the huge choice she has in her wardrobe, and selected something better suited for both occasions. Madame Macron is the winner for me as well. Smart, chic and appropriate. To equate this dress with grade school dressing is almost sacrilegious. This designer studied architecture and has incorporated it into his love for fashion. This is not just a dress. Avant garde or fashion forward perhaps? It's like saying the Eiffel tower is a pile of metal. ...and should there always be winners and losers for something as simple as an exhibit? middle school? I thoroughly disagree with Pine! This is a wonderfully designed dress globally. The very single details are not the most important but the overall design. Well done to the designer and Qn Letizia. Agree with you anon 4.01 and 7.51 too. I actually laughed when I read Pine's post. Anon 4:01, you put it so well. MaryT, thanks for jumping on board. Letizia looks stunning. Her dress is beautifully constructed, and the fit is impeccable. Mme Macron's dress is a little short to me. I think it would look more elegant at a longer length. I love the friendly relationship they seem to have. What happen Letizia and Brigitte stepped out of Vogue. Both Ladies look fantastic. Well done. They look fantastic, to try to say otherways is ridiculous. The elegance of Letizia was proved way before "Megan"came to the world of well dressed. It's so boring to hear the refrain "messy bun like Meghan's" oh pleeeease, stop already! both Letizia and Brigitte look very good. Letizia's so elegant. Yes, stop with the hair! The bun is in style. Too bad if you don't like it. Some of the reactions to the messy bun are so strong it's as though the people posting their hatred for them are being forced to wear their hair that way. La Reina está maravillosamente bella y elegante. Ese DelPozo es una obra de arte de estructura y un color azul tinta muy favorecedor. 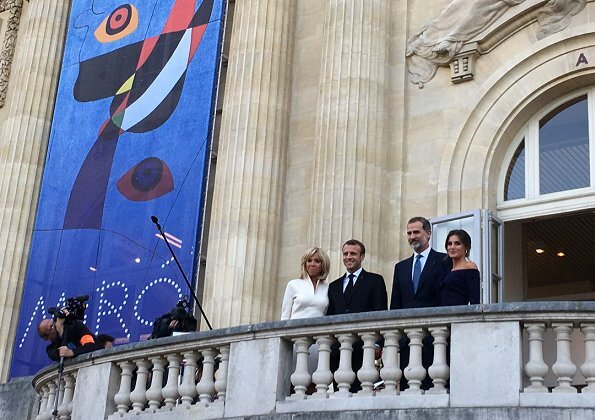 Mme Macron está bien, en su línea sobria y chic, aunque el vestido le hace arrugas entre las axilas y el busto. Angie, fully agree with everything you mentioned. The agenda was to have dinner at the palace,chances are that we'll never find out why the event was nixed and moved to a restaurant, which in itself is a rather unusual way to host a royal couple. The queen was appropriately dressed for such event ( let's not forget she is the sovereign) and the dress is exquisite, obviously we all have different taste in fashion, but to call this dress a child's work borders on a total ignorance of couture..
Liv Alba, your comment is so judgmental, and subjective that really doesn't belong in a forum where most people avoid the personal attacks. Maybe you should practice constructive criticism and civil discourse. Showing her figure?? Are you watching the same photos ?? Nothing wrong with Liv Alba comment, me and by the way other people on other websites - Spanish dailies, international newspaper sites etc. think the same. And the thought is that she is so preoccupied with her appearance that this seems to be the pinnacle of her life. To make sure she is the best dressed and can beat anyone else, even the french. If that's the role of a queen, I doubt. @11:47. She has to represent her husband and the girls by always being impeccably dressed and groomed. She functions within a very narrow scope and and does very well. Do not invent. No sé de qué figura hablas, si el vestido es de falda amplia y por debajo de la rodilla. Y no, ella no está más preocupada de su apariencia que las demás, porque se viste habitualmente de forma sencilla, muchas veces low cost, repite la ropa continuamente y sin más joyas que los pendientes. Pero un hater repite y repite las mismas mentiras mil veces para hacer creer que son verdad. La rosa del pináculo ya es de traca. No fueron al Eliseo:fueron a un restaurante a cenar!! 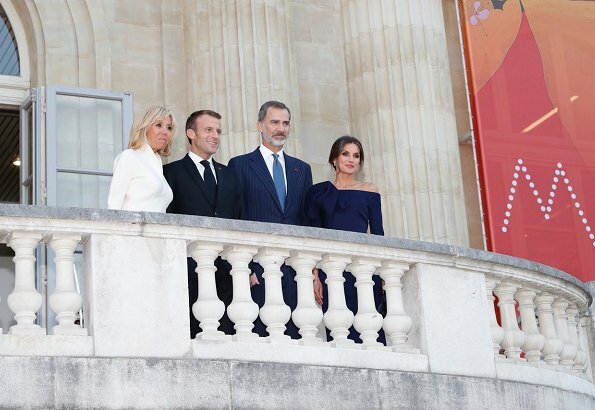 Ambas están elegantes, Mme Macron a su edad 65 años perfecta!! 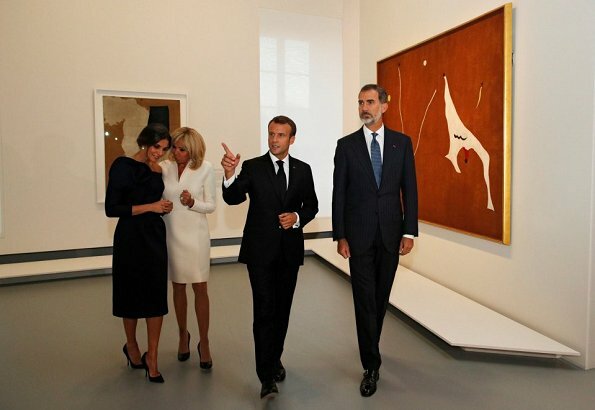 Ya sabemos que no fueron al Elíseo, sino a un restaurante, pero la cena en Palacio era lo que estaba previsto y constaba en las Agenda de Casa Real y Macron. ¿Sabes leer? Teresa2424. 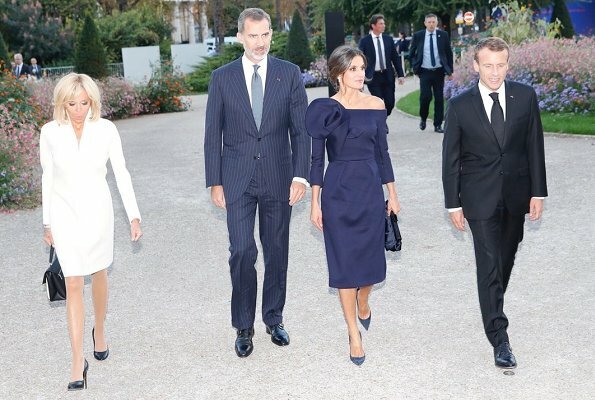 La reina emérita Sofía just got upset with a guest while attending a wedding, because he referred to her husband as Rey emérito, she corrected him and stated that he was " The King" , it looks to me that she still hasn't assumed their positions, and yes Letizia is the consorte, we get it!! Queen Sofia respected the protocol and said King Juan Carlos. Not more and not less. Letizia - wonderful as always. I do admit I dislike Mme Macrons "I want to be a juvenile jet-setter"-style. Anonymous @ 11:47, yes, there are many sites, forums, tabloids, and rag magazines that constantly feed the need for speculation, and malicious gossiping of a sector of society, and then, there is another part of the population that look at the agenda, and the causes that gain visibility because of such. I personally don't care much for psycology 101 behind a keyboard, neither do I care about the private lives of public persons, and that is why I visit this blog, and others. I would hate to see this forum become one of those places where people enter to promote their agendas and personal feelings towards certain people. "émerito" is just an adjective. His correct name is King Juan Carlos and he retains the title until his death. It is a honorary title and was established by law at his abdication. See also casa real.es, "La Familia Real".